A brief description of the Tomb of Grapes follows. The Tomb of the Grapes is located about 1.6 mi. [2.5 km.] north northwest of the Old City of Jerusalem in an open space in a park located between apartment buildings. 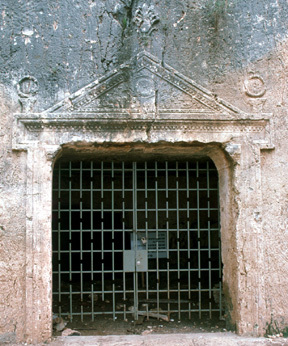 This tomb consists of a forecourt, a central chamber, three rooms with kokhim (loculi), and a chamber with arcosolia. Greek influence is found throughout this tomb. Its pediment has a beautiful grape design, and thus the name "Tomb of Grapes."